This Bible study is based on the Gospel of John Chapter 2 where we find the story of Jesus at the wedding at Cana in Galilee. This is also where we see Jesus drive the moneychangers from the Temple complex. Your learning comes from reading and studying the Bible. After you've read the Scripture passage below, answer the following questions. It's a good idea to do them every day, so we offer to email the questions to you every day - just sign up below. Answer the questions below. You can download these questions to work on your own, or we can email the daily questions to you. Click here to download a workbook for the Gospel of John Chapter 2. If you want the questions emailed to you, complete the form below. You will get 6 emails with the questions for each day. A seventh email will allow you to compare your answers and take you to Chapter 3. 1. What do we learn about Jewish wedding customs from reading the parables in Matthew 22:1-12 and 25:1-10? 2. Name the disciples of Jesus to this point from Chapter 1 of the Gospel of John. 3. What are some possible meanings for the answer Jesus gave his mother in verse 4 when he stated - “mine hour is not yet come”? 1. From verse 11, what can you determine were the 2 results of the miracle Jesus performed at the wedding at Cana? 2. From reading the Gospel of John Chapter 2 verse 16, and Matthew 21:13, what was the reason Jesus drove the people and animals from the temple courts? 3. Compare the reaction of the disciples and the Jewish leaders to Jesus’ clearing of the moneychangers and animals. 1. In response to the Jewish leaders request for a miracle to show authorization for Jesus’ clearing of the temple courts, Jesus states: “Destroy this temple, and in three days I will raise it up”. What do you think is the most remarkable aspect of Jesus response? 2. Where in Scripture is the body of the believer referred to as a temple? 3. In your opinion, why do you think Jesus never explained the reference to himself as the temple? 1. 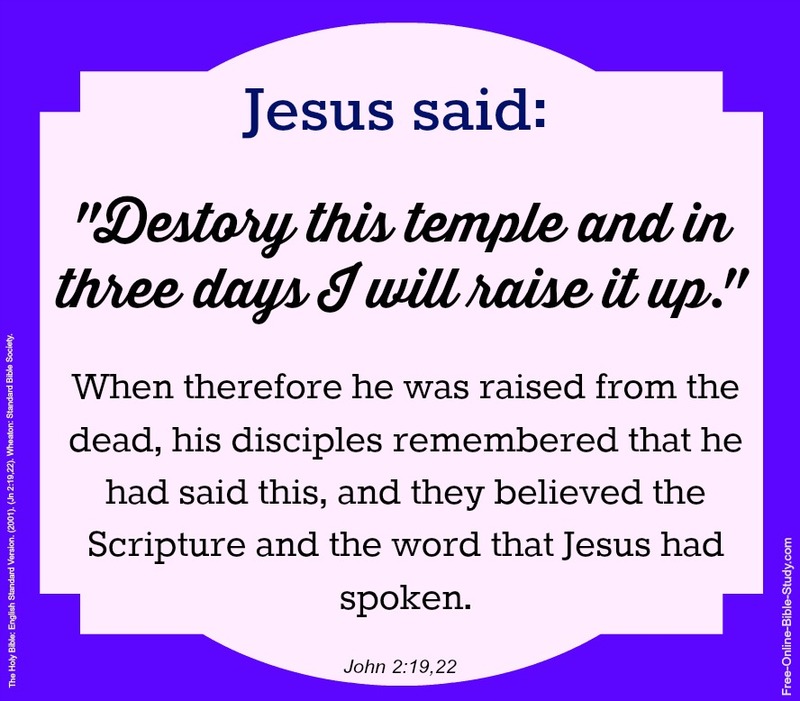 What are the 3 things mentioned in verse 22 concerning Jesus’ disciples that occurred after the resurrection? 2. Read Acts 2:29-32. What Old Testament scripture predicted the resurrection of Jesus? 3. In verse 23 we read that Jesus did many miracles while at the Passover Feast in Jerusalem. These miracles are not described, but from the following verses, describe their impact. 1. From verse 24, what two things did Jesus not do? 2. Again from verse 24, what reasons are given for Jesus decisions? 3. What might Jesus have seen in the people that caused him to not entrust himself to the people of Jerusalem? 1. What is about your life that Jesus overlooks and loves you anyway? 2. From the first 2 chapters of John, give 2 examples of Jesus’ power of knowing things about men without having been revealed to him by men. We hope and pray that this Bible study of the Gospel of John Chapter 2 has blessed you!